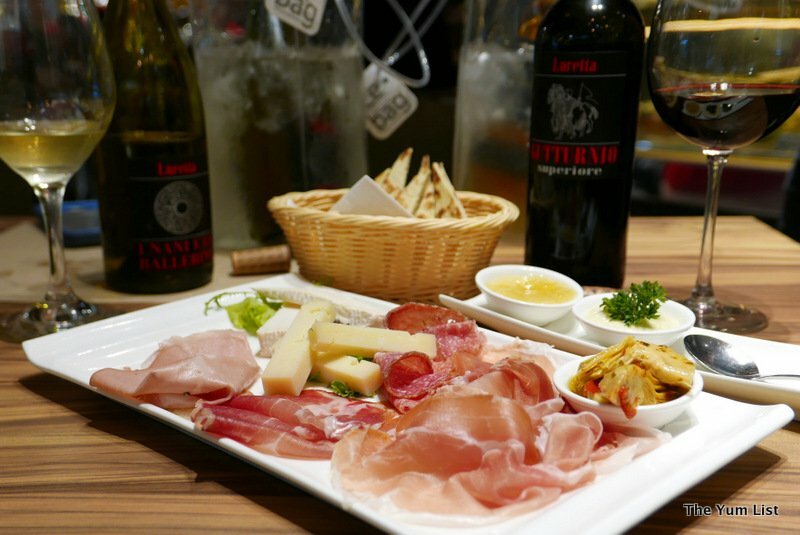 Innocuously hidden away on the top floor of Isetan in One Utama, surrounded by Japanese restaurants, is an absolute treasure trove of cured meats, stockpiles of virgin olive oils, Mediterranean cheeses and handmade pestos and jams. Luretta D.O.P. is an authentic Italian deli filled with shelves full of directly imported ingredients. Italian food aficionados and newcomers alike will delight in the availability, accessibility, and advice on offer. Did I mention the organic Italian wine? Or the desserts made from recipes handed down over generations? Are you salivating yet? You should be. Run by brothers Emil Sassolini, whose love of authentic Italian food weaves its way through the menu and produce, and Nico Sassolini, whose love and knowledge of Italian wines provides perfect pairings for customer meals; whether you are eating in the restaurant or creating a masterpiece at home from D.O.P. ingredients you can be assured of a genuine slice of Italia. The culmination of experience and passion created by the family means Luretta D.O.P. are fastidious about bringing true and authentic regional Italian products of the highest quality and flavour to the KL culinary scene. Named for Denominazione di Origine Protetta, the term used to protect the names of food products that originate from a specific geographic location, nearly all of Luretta’s ingredients come direct from Italy, and are prepared using traditional methods. Similar to buying a bottle of Champagne and knowing it has come from France, eating or buying at Luretta D.O.P. is as bona fide Italian as you can get outside of Italy. Emil explains that when they first tried many of their traditional recipes here, the local ingredients changed the flavour of the dishes. 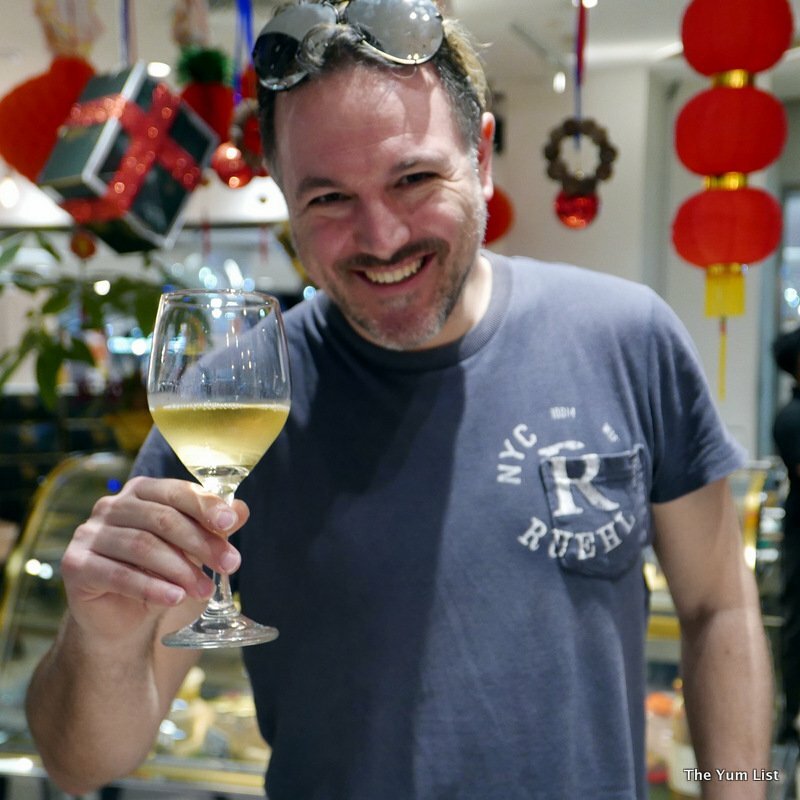 After experimenting with many different Southeast Asian sources, he began importing the bulk of his ingredients from home, only reverting to local produce in a small selection of menu items when he was sure it did not alter the taste. 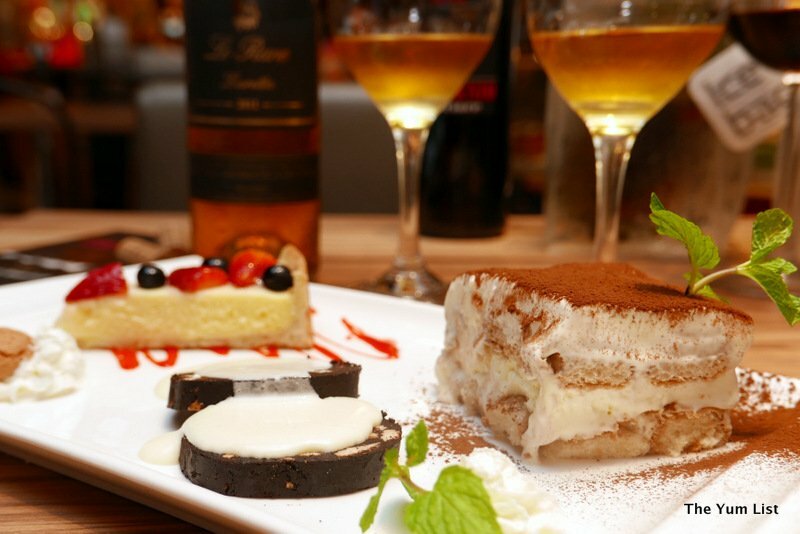 The result is a little patch of Italy in the middle of Damansara, where you can gorge yourself on Italian comfort food until the top button of your trousers becomes uncomfortably tight. If like me, you enjoy cooking at home, you can also buy a range of their key ingredients to take home and prepare yourself. 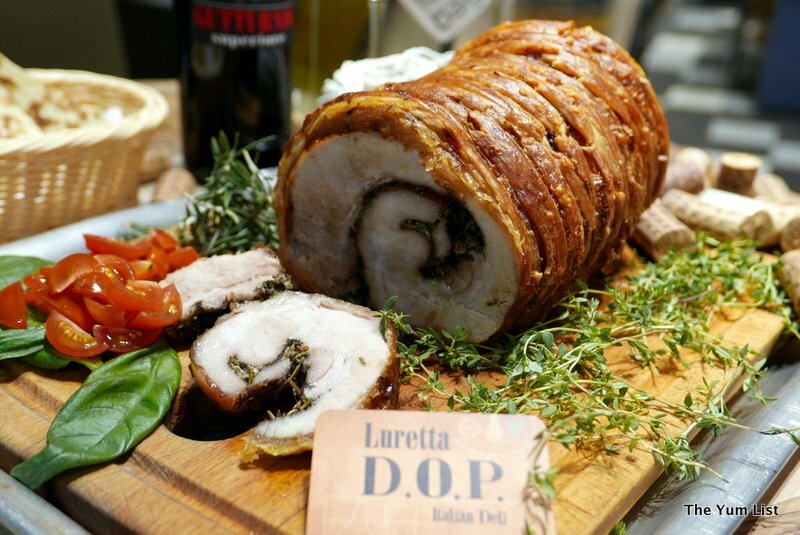 If you’re just looking for an excuse to indulge in private, or seeking the perfect dish to wow the socks off your next dinner party guests, Luretta D.O.P. needs to be at the top of your shopping list. What is more, lessons on how to cook like the Italians are readily forthcoming. Like all true Italian chefs, Emil loves passing on his wisdom to anyone who shares his love of good Italian food, peppering his advice with storytelling and cheeky jokes. Bring a notepad and pen to write down all his tips and tricks! 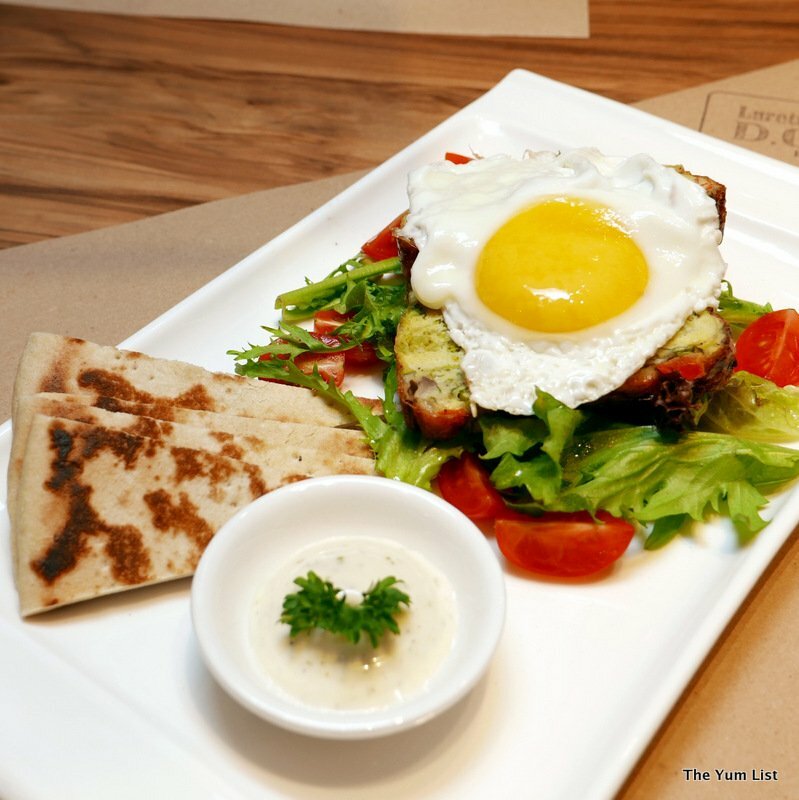 The Frittata Vegetarian (RM22) is a great choice for any time of day and especially good if you’re looking for a late brunch with a difference. An egg based mixture with zucchini, tomato, eggplant, broccoli, peas, carrot, beans, and fresh salad greens, it is oven baked to maintain flavour without the excess of oil or fat that comes with pan frying. It is served with a salad lightly dressed with a splash of olive oil, a ‘just-cooked’ egg that melts through the dish to produce a creamy sauce and Luretta’s secret tangy citrus mayonnaise sauce. 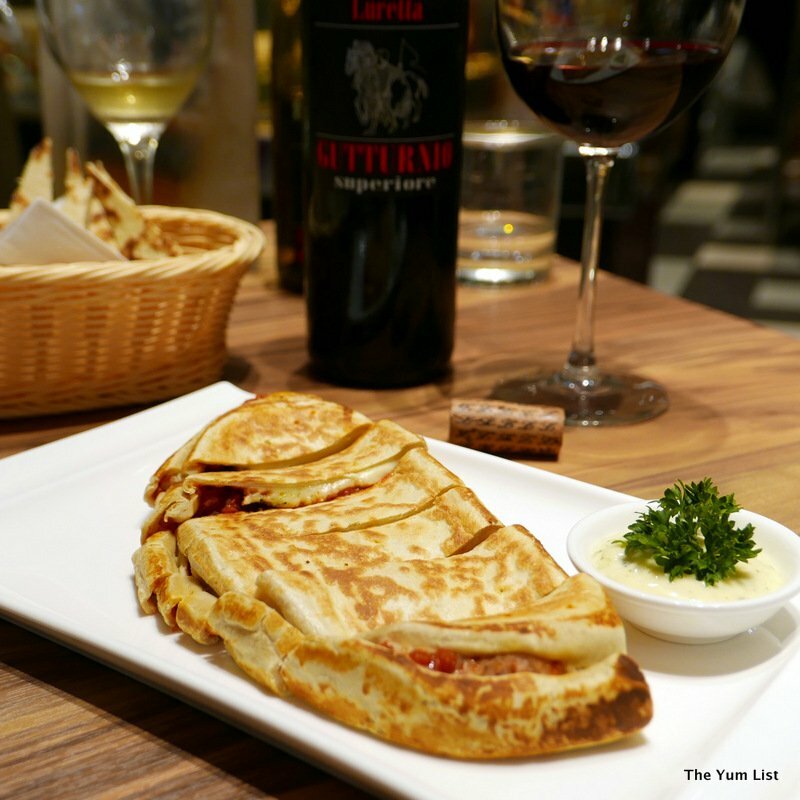 Many of the dishes on the menu also come with an accompanying side of Piadina bread, a flat, yeast-free bread made from a recipe from Emil’s hometown region of Emilia-Romagnia, north of Toscana. Emil imports the flour direct from home, mixing it with extra virgin olive oil, salt and water to create a pure and iconic flavour. Nico brings out a bottle of Luretta I Nani e Le Ballerine Sauvignon Blanc, 2015 to accompany Emil’s first dishes. 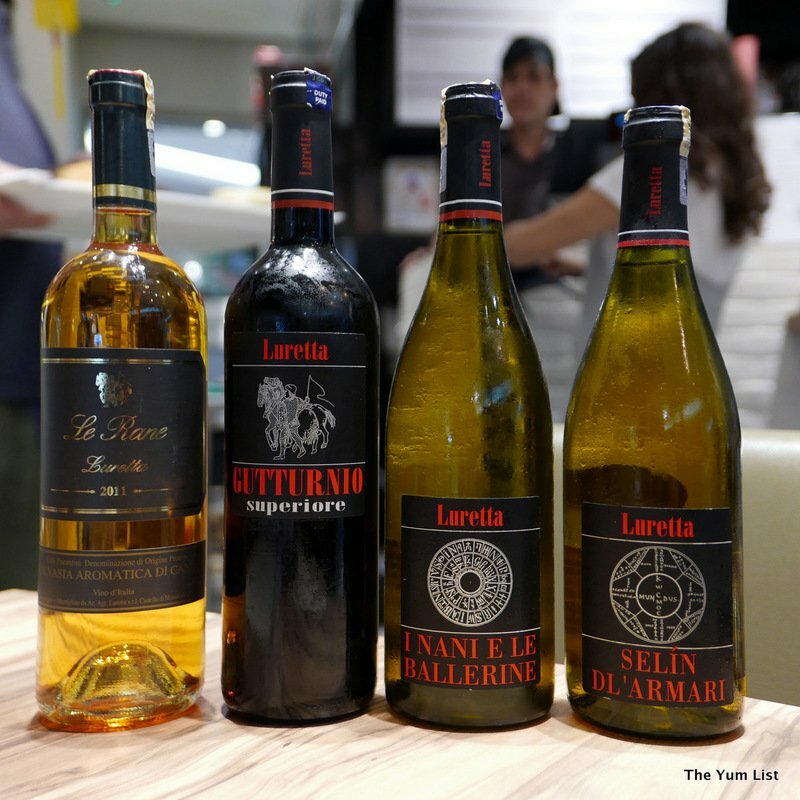 The wine comes from the Luretta Castello di Momeliano vineyard, with plots in the Luretta and Nure Valleys, each lying 200 metres above sea level for cooler growing conditions. The vineyard is totally organically cultivated in accordance with ICEA/AIAB Operatore Controllato H821 Biological Farming Criteria. Completely free from chemical enhancement, the flavours are purer, more crisp. For those suffering from allergies or reactions to most wines, particularly those heavy in sulfites, organic wine may be your ticket to enjoying a glass again. In addition to the benefits of organic production, the 200,000 bottles produced here each year are D.O.C. (controlled origin appellation) and I.G.T. (characteristic geographical indication) meaning they are archetypically Italian in flavour and style. This sauvignon is wholly different from its New Zealand and Australian counterparts, with very subtle and light pineapple and mango flavours dancing in the undertones. To really appreciate true Italian cuisine and the difference in taste D.O.P. 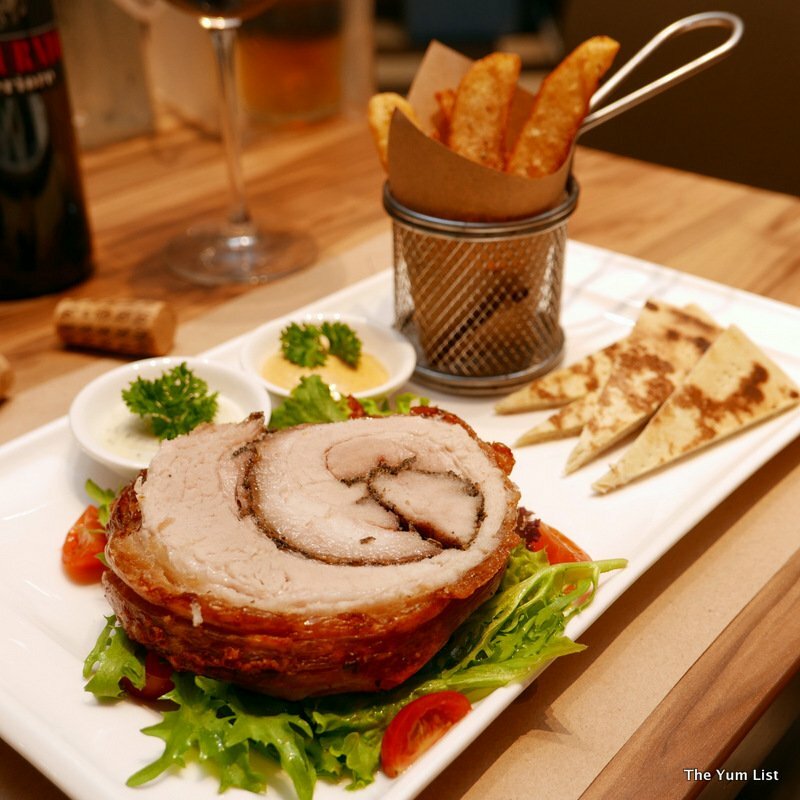 ingredients offer, a Cold Cuts Platter (RM39) is an absolute must order. Luretta’s antipasto comprises a healthy sampling of Mortadella ham, cut from a 50kg slab, Coppa Piacentina, a particularly flavoursome aged pork, Sandanielle ham, originating in a small Italian province of the same name in Treviso, North of Venice, and some fragrant Salami Milano, more complex and well balanced than common Salami varieties. Accompanying the meats are a slice of Carsela D.O.P., a 90 day aged cheese made from cows that only graze above 2000 metres. The result is a pure and intense soft cheese reflecting the very high quality pastures at these altitudes. We are also treated to some Tresignori – a half cow, half goat cheese combination that is delectable, strong in flavour yet not as overpowering as full goats cheese. No antipasto platter would be complete without some marinated artichokes, sweet and bursting with a very light olive oil dressing, as well as some Luretta D.O.P. specialty homemade honeydew melon jam, made with less sugar to produce a richer, more refined and almost tangy taste. When eaten with a mouthful of cheese and meat, the jam is a more than worthy rival of Spanish Quince paste. 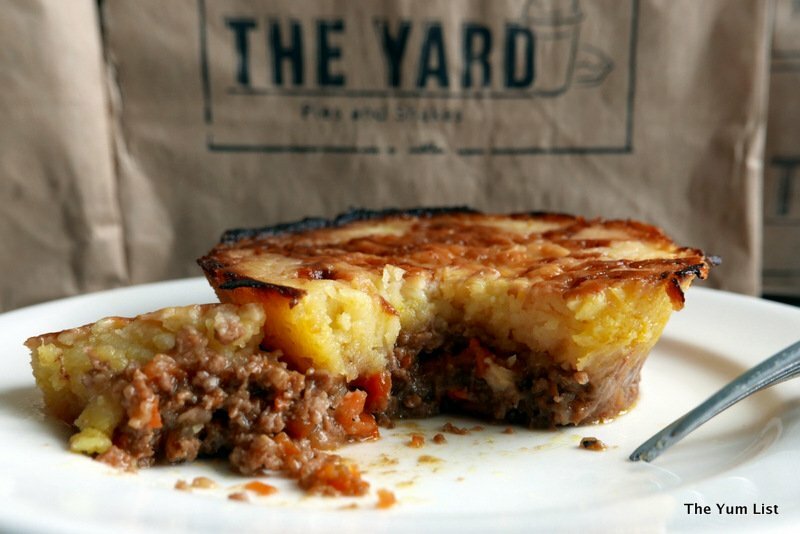 Yet another regional specialty, the Crescioni is similar to a calzone, or folded pizza. We try the Crescione Pomodore e Mozzarella Basilico (RM23), made with two kinds of Italian imported tomatoes, one sweet and one sour, for the perfect chunky combination, as well as oregano, basil, onion and buffalo mozzarella from the Naples region. The pizza base is made from the same high quality imported Italian flour, giving it a pure and wholesome flavour you won’t find anywhere else in KL. Flushing proudly, Emil is very excited about the next dish he has lined up for us. Some might say that the Germans produce the best sausage in the world, but I believe the Italians have them beaten! Emil imports his stronger lamb intestine sausage casing from his homeland, allowing for a thicker and juicier product, keeping the inner meat more tender. He buys 100% local Malaysian high quality pork shoulder which he minces with salt, pepper, red wine and garlic, and when cooked, serves with a heaping of grilled onion (RM19 for one, RM32 for two). Bellissimo! Emil’s sausages are all hand made by the man himself and are also available to purchase and cook at home. Take home sausages are sold in a single rope and are RM59 per kilo or RM29.50 for 500g. 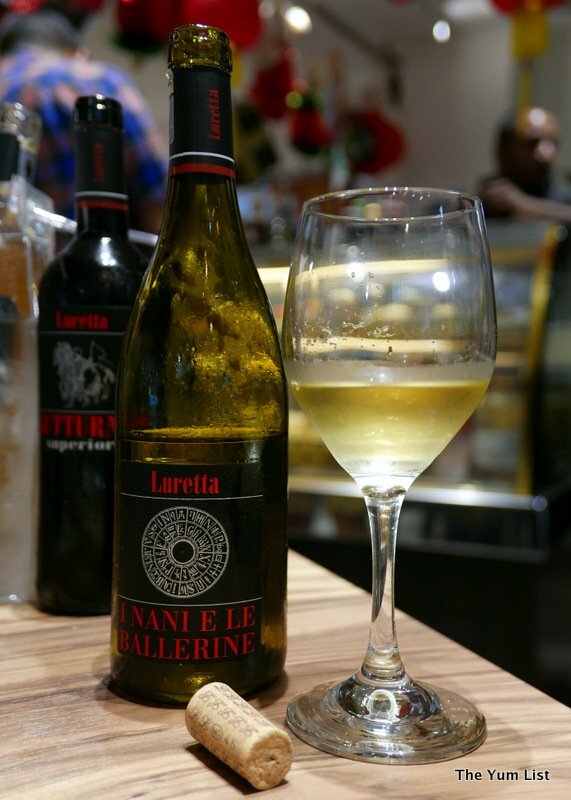 For our second wine tasting, Nicco produces a bottle of Luretta Vineyard’s 2013 Selín Dl’Armari Chardonnay. With an almost French style structure to the palate, Nicco describes this bottle as aromatic and happy, romantic even. Complex and made classically but with a richer smokiness and oak finish, and no headache after drinking thanks to the organic production. A beautiful pairing for the pasta to follow. 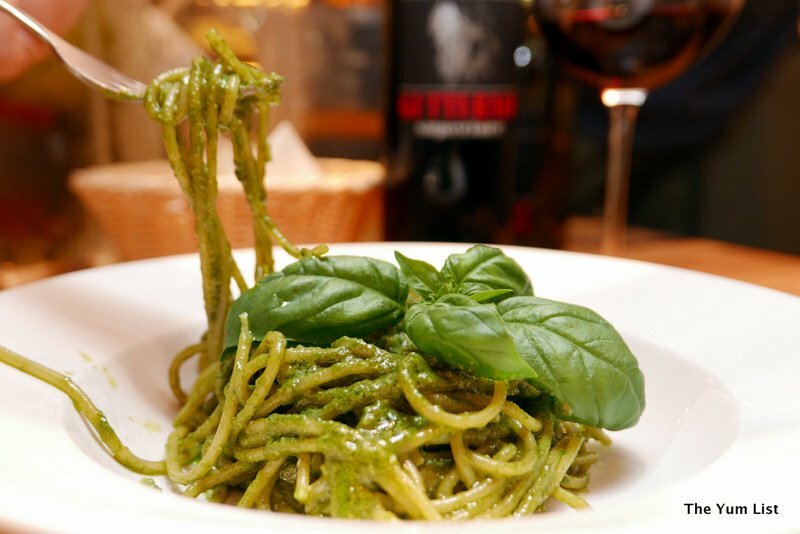 For true authentic Italian connoisseurs, the Basil Pesto Spaghetti is essential. Available on request, it is simple, uncomplicated and oh-so-good! 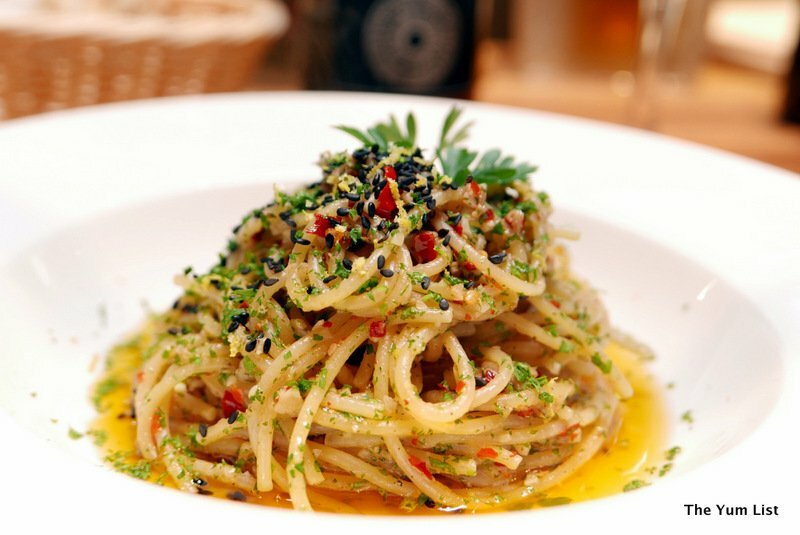 Clumps of fresh, chunky pureed basil cling to each strand of spaghetti. On my own visits to Rome and Tuscany, this is how the Italians always served their pasta, a basil pesto with pine nuts stirred through fresh spaghetti. Luretta D.O.P. uses pasta trafilata al bronzo, or pasta extruded through traditional bronze pasta makers, offering a true and genuine flavour. The pesto is homemade to Emil’s family recipe and can be bought in jars to take home for RM30. Only a small amount is needed, but even so, it may not last in your cupboard for long! Emil instructs us to stir the pesto through the pasta only after the pasta has finished cooking and has been taken off the heat. He suggests adding a splash of olive oil, but cautions that olive oil should not be fried or overheated as it loses its properties and flavour. Luretta also stocks a range of quality Italian olive oils at reasonable prices, and I recommend picking up a bottle when you next visit. The education in good pasta continues with the Spicy Fish Spaghetti, a new menu item. It is made using dried fish from Calabria (the toe of the Italian boot) which are combined with chilli and marinated in extra virgin olive oil before exporting. Emil adds a mixture of parsley, garlic, black sesame, lemon rind and fresh oil before tossing through the spaghetti. This is how chilli should be eaten, developing slowly in the mouth before elevating all other flavours, bringing the light brine of the fish to the front of the palate. Smoothed over with a sip of chardonnay. Before the meat is brought out Nico opens a bottle of the 2013 Luretta Gutturnio Superiore. A medium bodied dry red with berry tones blended from two grape varietals, the Barbera gives structure and boldness, and the local Bornada lends elegance and delicacy. In contrast to other European wine growing regions, Nico describes Italian wines as a bit wilder, somewhat rude, while also maintaining an elegant balance. In short, they are fun to drink! Our next dish is a lesson in Porchetta from the Italians (pictured below but also in the featured photo at the top). Too often I have had bad Porchetta in KL, with thick layers of fat overwhelming the palate and taking away from the texture and flavour. This, however, is exceptional. A hardened layer of just-right crackling encases an ultra thin ribbon of fat and a thick slab of juicy pork heightened by a layer of traditional Italian herbs. The meat is so tender, so juicy, it breaks apart easily and does not require any sauce. When asked what his secret to perfect crackling is, Emil winks, saying “It took me 10 months to unearth, I have to have some secrets!”. Considering most of his secrets are stocked on his shelves and in his cabinets, we might let him have this one. Just when we’re all fit to burst, Emil brings out one of his famous Squacquerone sandwiches. Cries of “You have to try this!” and “Mangiare! Mangiare!” (Eat! Eat!) 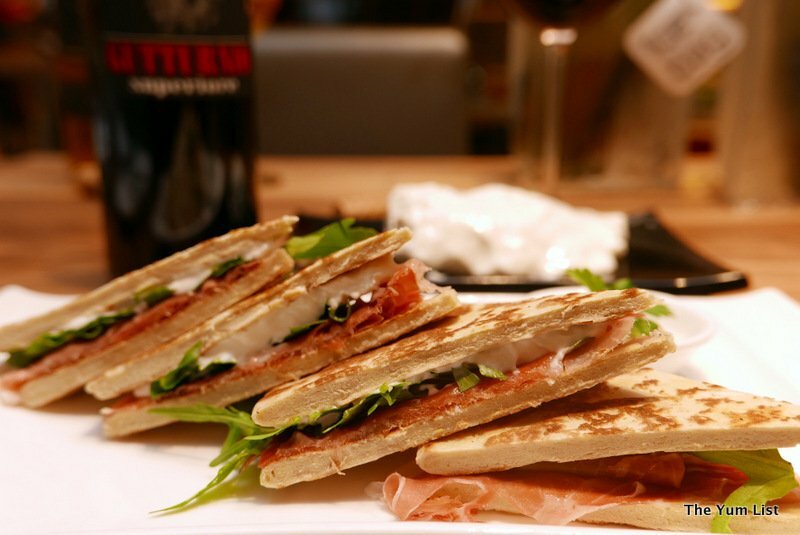 are as tantalising as the smell of toasted squacquerone cheese and San Danielle ham, served with rocket on warm piadina bread. The creamy, slightly sour cheese is served very fresh and not aged, with a yoghurt-like taste. It’s too much temptation. The diet will have to wait until tomorrow! 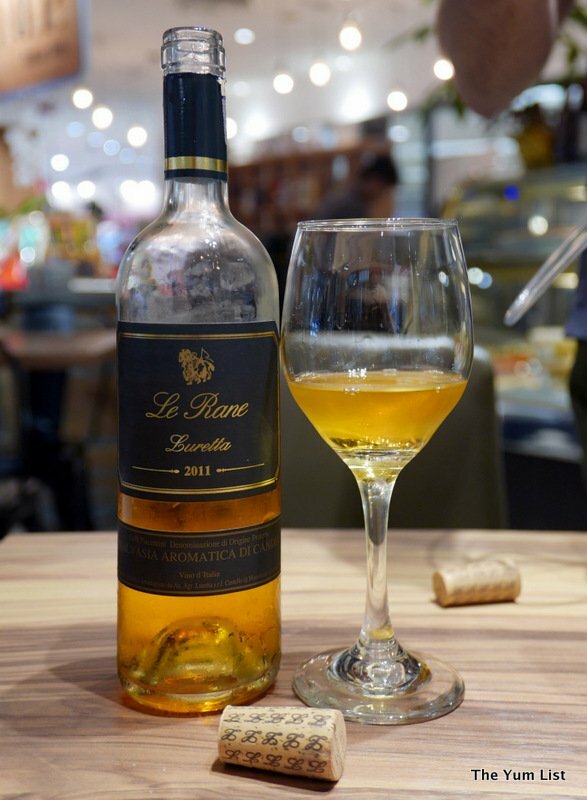 A 2011 Luretta Le Rane Malvasia Dolce is chosen to accompany dessert. Made from a sweeter, aromatic grape picked very late, they are kept at a constant five degrees to maintain freshness until reaching ultimate maturation before processing. With apricot and white flower notes it is an excellent choice for cheese and chocolate. Despite having already eaten so much, when dessert is brought out, it is just too good to refuse. When you eat Italian food, you just have to forget about your waistline, embrace the muffin top! The iconic Tiramisu (RM16) is first, and is one of the creamiest, most satisfying I’ve ever tasted. A non-alcoholic version, the clear, elevated espresso is present in every bite. When asked his secret, Emil grins “The secret ingredient… is love!”. It is so unabashedly clichèd, yet so true. The Italians put their passion and love into everything they make. 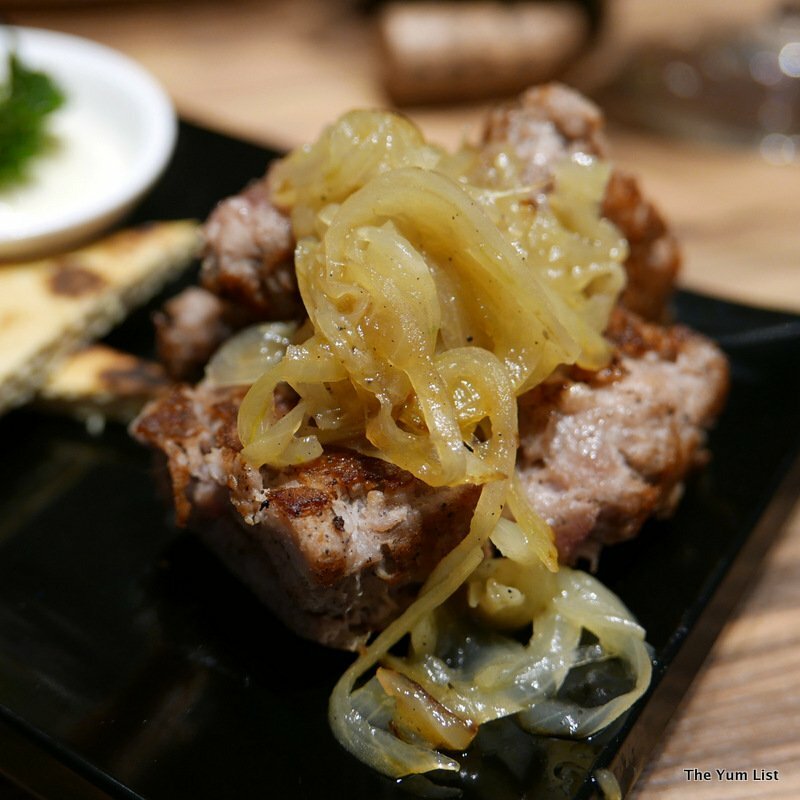 A little more rough around the edges than some other European cuisines, their heart and soul is evident in the ingredients, and the methods passed down from generation to generation. Emil’s Chocolate Salami (RM13) recipe comes from his father and was the family favourite among kids, grandkids and parents alike when he was growing up. It’s not hard to understand why. Dark, thick chocolate sticks to the roof of your mouth and is balanced with chunks of Italian biscuit and buttery sugar. You only need a very small portion, but I have to exercise extreme self-control to not buy an entire log to take home with me! The comparatively understated Strawberry Tart (RM14) is a creamy custard topped with fresh strawberries and blueberries atop a traditional Italian pastry. Always a good choice, this is a rustic and wholesome version. 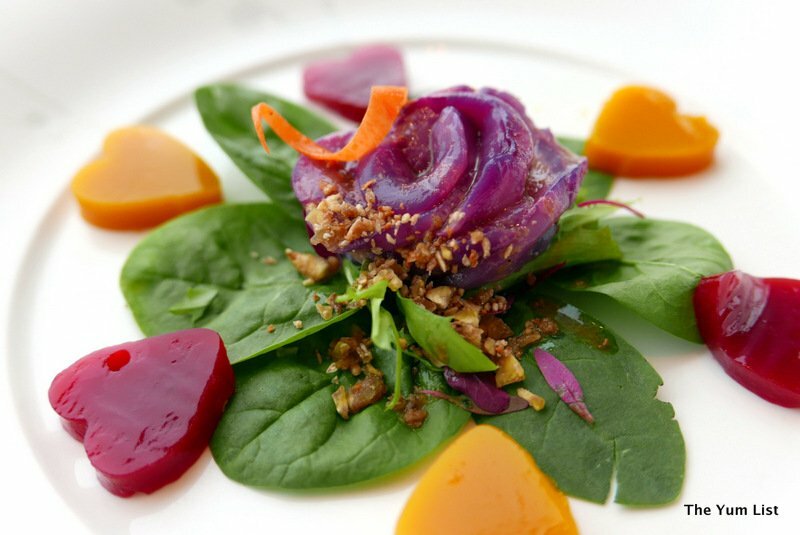 The quality of the ingredients and the freshness of the pastry are nothing short of heavenly. Luretta D.O.P. is open 10am-10pm Sunday to Thursday, extending closing for a further half an hour on Friday and Saturday nights. 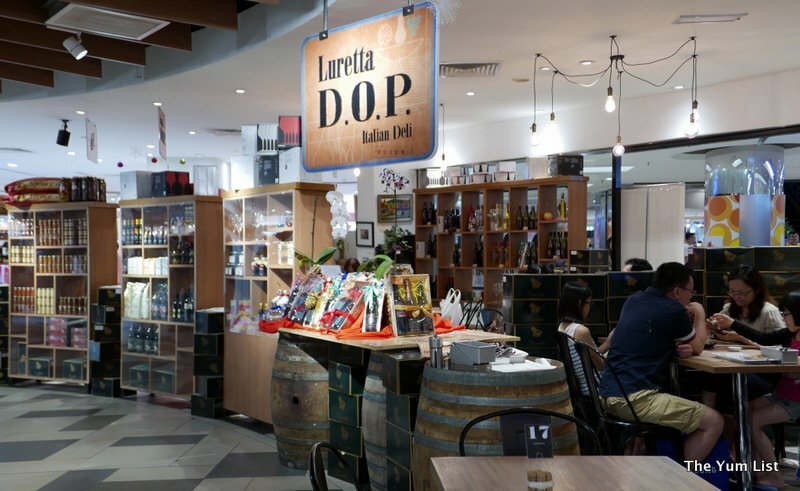 If braving the crowds at One Utama on the weekends isn’t for you, then book into one of Luretta D.O.P.’s Apericena Events, limited to around 100 people. Hosted around the middle of the month, on a Friday evening from 7pm-10pm, you can come and indulge in a buffet of tapas and small plates paired with wines and aperitifs. The cover of RM100 will include four glasses of wine, one aperol, and a buffet of antipasto and dessert. While the dress code is smart casual, you may want to wear your stretchiest clothing as overeating is unavoidable! Have a look at their Facebook page for their next event. All prices provided are inclusive of GST. Wine prices subject to availability and years of production. Price upon application. Italian passion? Yes, word has it that they’re very passionate people…like the French. LOL!!! Lots of fun to be around. That’s a good selection of Italian delights! Yummy spot for Italian food fans. I do love Italian sausage, but the mild one, not the hot and spicy. Lovely presentations! I prefer the mildly spiced version to Linda. So many authentic Italian restaurants in KL these days! He wouldn’t tell his secret! Food looks gorgeous and the write up was fabulous!